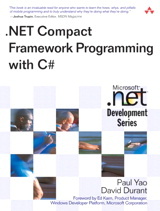 This book is the definitive tutorial and reference for the .NET Compact Framework (CF). It shows you how to transfer your skills and your code to the Pocket PC 2003 and other mobile and embedded smart devices. Authors Paul Yao and David Durant draw upon their years of research and experience with members of the Microsoft .NET CF team to show you exactly how the best CF programming gets done in C#. This is the only book a programmer needs to master the art of CF coding. Throughout the book, sample code and examples illustrate best practices and programming techniques. In addition, the companion Web site includes downloadable code for all these examples along with a set of development tools to help you with your CF development projects.